The following guide is a complete walkthrough for installing a fresh version of OS X Yosemite. It requires no experience and all of the necessary installation and post-installation tools are available on tonymacx86.com. UniBeast is a tool that creates a bootable installer out of your downloaded version of OS X. In order to start fresh, you'll need access to a functional computer running Mac OS X Snow Leopard 10.6.8 or later. This is a requirement, as you need access to the Mac App Store to download OS X and create the installation drive. To start from scratch, booting the 10.6 Snow Leopard Retail DVD directly, check out iBoot + MultiBeast. 1. Register here at tonymacx86! If you don't have a user account, create one! 2. Get our latest MultiBeast and UniBeast tools from the downloads section. 3. Purchase a 8GB or larger USB drive. The following guide is meant as a fresh installation method. To perform an update from OS X Mavericks to OS X Yosemite, saving system settings, data, and apps follow this guide. The full operating system is a free download for anyone who has purchased Mac OS X Snow Leopard, Lion, or Mountain Lion, or a Mac preloaded with Mavericks. Download the Application from the Mac App Store using your Apple ID on any Mac or functional computer running Mac OS X 10.6.8 or later. The Application Install OS X Yosemite will appear in /Applications. Take a deep breath and take your time- this is pretty simple, but it's easy to miss things if you rush. Follow each step to the letter. UniBeast will now create the bootable USB drive. The process will only take about 10-15 minutes, depending on system and drive speed. Do not unplug or stop during this time. 20. Drag MultiBeast to your completed USB drive. If you're installing on a recommended CustoMac desktop with AMI UEFI BIOS, the options are simple. For other systems make sure to set your BIOS to Optimized Defaults, and your hard drive to AHCI mode. Here are standard AMI UEFI BIOS settings for Gigabyte AMI UEFI BIOS, Gigabyte AWARD BIOS, ASUS AMI UEFI BIOS, and MSI AMI UEFI BIOS. You're almost done! All you need to do is boot from the USB drive and install! If you have trouble reaching the installer, type -x at the Boot screen as shown below. You can type the boot flags GraphicsEnabler=Yes, PCIRootUID=1, maxmem=4096, maxmem=8192, and npci=0x2000 by themselves or together in order to solve boot issues for older graphics cards and machines. Type -v to bypass the Apple boot screen and enter verbose startup mode. X58 and X79 systems always need npci=0x2000. For further explanations of boot flags, check out the post here. Also, if you need help with what to use for your graphics card, see the post here. 5. When you arrive at the Installer, choose language. 6. For a new installation of OS X, you MUST erase and format the destination drive according to the following steps before continuing. b. Highlight your target hard drive for the Yosemite installation in left column. 7. When the installer asks you where to install, choose Yosemite, or your existing install. 8. Upon completion, restart the system. MultiBeast is an all-in-one post-installation tool designed to enable boot from hard drive, and install support for Audio, Network, and Graphics. In addition it includes System Utilities to repair permissions and a collection of drivers and config files. The installation is complete, but the drive isn't bootable yet. Boot from the USB again, this time choosing Yosemite. 4. At the Chimera Boot Screen, choose your new Yosemite installation. 7. If this is a fresh installation, click Quick Start to choose EasyBeast, UserDSDT, or DSDT-Free. Yay! 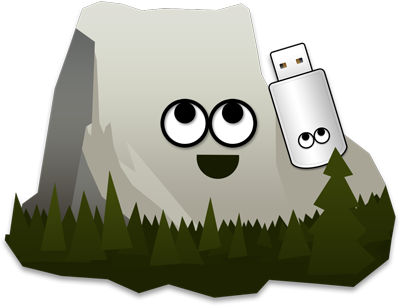 You now have a fully updated bootable version of OS X Yosemite on your CustoMac! And a super handy USB rescue drive. It's easy to get frustrated, but don't give up! If you get stuck, there are many users with similar hardware in the tonymacx86 Forum to provide support. Special thanks to everyone in the community, and our moderators for testing! After you've completed the guide, things such as HDMI audio and iMessage may not work automatically and universally. The list below should serve to fully optimize your system after initial setup. NVIDIA releases alternate graphics drivers separately on the web for each OS X build. These are different from the drivers Apple ships as standard, and should be considered experimental. In the past, the drivers have been known to solve OpenCL issues with certain applications, as well as providing better native GPU power management for certain devices. They also will enable the latest 'Maxwell' cards to work with full acceleration- NVIDIA GeForce GTX 750, GTX 750 Ti, GTX 970, and GTX 980. They also will enable the latest 'Maxwell' cards to work with full acceleration- NVIDIA GeForce GTX 750, GTX 750 Ti, GTX 970, and GTX 980. Woo-hoo! My Dual 970's should be very happy to hear that. Is there a way to upgrade my current Mavericks Hackintosh to Yosemite without wiping my SSD? Thanks! Great work Tony.. The speed of your updates is amazing !!! any news on iMessage FileNVRAM update? No. You'll know when we know. So much for being an Early Adopter. Will there be an upgrade guide as well, or do I need to try and if all fails clean install Yosemite? Also, thanks for all your work! "The following guide is meant as a fresh installation method. To perform an update from OS X Mavericks to OS X Yosemite, saving system settings, data, and apps follow this guide." hi installed Yosemite, all went perfect.. But have no sound and no ethernet, i'm using a gigabyte GA-Z77N-wifi.. use ALC892 for sound and Realtek RTL8169 for ethernet as i did with ML & Maverick.. But they don't work on Yosemite, i'm i the only one, or are we waiting for updates?